Etherium is never aggressively terrible, but theres nothing to recommend it over other, more interesting RTS games. Etherium isn’t awful. I’ll be spending a lot of time talking about why it isn’t good, but I want to reinforce this central statement: it is never terrible. To be frank, it never tries anything risky enough to be truly horrible in any way. Instead, it is unexciting and inoffensive. If it were a color, it would be beige. 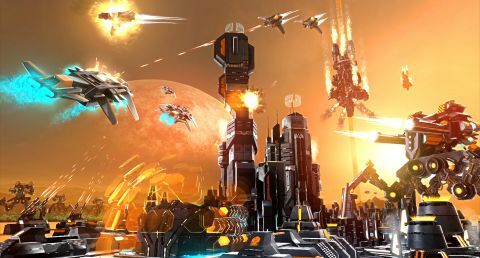 Like many real-time strategy games in the style of Supreme Commander, Etherium is a game about an interplanetary resource war. After making planetfall on a disputed chunk of dirt, both sides begin an arms race, constructing chains of colonies around energy-providing resource points. Etherium’s most interesting idea is its upgrade system. Instead of building a barracks or a research university to unlock new units, each colony comes with a limited number of upgrade spaces. Add a tech center to raise the overall tech level; add a refinery to boost resource collection. With so few available expansion slots, each upgrade built means that several others won’t be built. The hard limit forces hard choices. To win the game, I either stomp across the map and destroy the enemy colonies or build orbital cannons and wait while they slowly pummel the enemy space fleet until it abandons the planet. The planets themselves also play a role, as each features a separate biome and natural disaster: blizzards on the ice planets, dust storms on the desert planets, and so on. While fighting on an Earth-like planet in a hurricanes is an interesting diversion, it fails to have much effect beyond delaying unit deployments for a few seconds. Etherium would be perfectly serviceable but for two unforgivable sins. First: the graphics, sound, and animation are bafflingly poor. Even on maximum settings, squads of units float-waddle around the battlefield, stand stock-still, and unleash papery volleys of neon laser fire with other stationary enemies. Even the most interesting units, the highest-tech-level badasses, do an astonishing Scooby-Doo walk, floating across low-res ground textures out of sync with their footsteps. Graphics aren’t everything in an RTS, it’s true, but such poor production details feel, to me, emblematic of the game’s unfinished quality. The second great sin is its insistence on micromanagement as a replacement for strategy. There are no keyboard shortcuts for unit deployment and, in fact, there is no way to set up auto production lines for new units. Each and every deployment begins by clicking on the unit tree, clicking on the unit type, then clicking on the ground around the drop zone. After waiting a few seconds for a shuttle to bring troops in from orbit, clicking the unit and clicking its destination will send it hover-waddling on its way. That five-click process must be performed for every new unit, and it must be performed by me, in real time, as I stare down at my home base. That’s a lot of time not spent directing forces in combat. Compounding this issue: forces require a lot of direction in combat. The malleable AI settings I’ve been so pampered by in other RTS games are absent here, so my units refuse to engage any enemy unless directly fired upon. If the enemy is smart enough to attack my colony instead of the tank division guarding it, they’ll get a few free punches in until I jump over to that side of the map and give my tanks orders. If I tilt my head to the side and squint, maybe after having a few stiff drinks, I can see how I might think that personally directing every unit, ordering reinforcements, formulating a strategy, and building new upgrades all at once would be chaotic fun. More than anything, though, I feel like I’m babysitting a bunch of morons. If comp-stomping isn’t your thing, Etherium unfortunately has nothing else to offer. As of this writing, the global Steam population has dwindled to 50 players over the last twenty-four hours. After waiting in a lobby for over an hour, I finally found one other player for a random one-on-one skirmish. Though playing with up to four players is technically possible, I can’t imagine a scenario where that many players would meet up at random. If you absolutely must play Etherium instead of the many other, more compelling RTS options, you might as well drag your friends in with you. And if you do, you might actually have some fun. Like I said, Etherium isn’t awful. It mostly works—though I did have a few crashes to desktop—and laughing with friends along the way could turn it into a good time. But even in the somewhat rarefied atmosphere of modern RTS games, there’s not enough here. Etherium’s few compelling ideas have already been done better in other games, from planet-hopping campaigns (Planetary Annihilation) to dynamic weather interruptions (Company of Heroes 2) to modular building upgrades (Grey Goo). Looking over the genre as it stands today, even the most ardent strategy fan has to admit that “mostly functional beige” just isn’t good enough. Air units can pass over impassible terrain and pummel ground units, but they’re vulnerable to other air units. The volcanic planet is visually striking, and lava flows always heat things up. Get it? Heat things up? You got it. This weird sepia Instagram filter is what passes for a hurricane in Etherium. The Vectide Empire is a little bit insect, a little bit steampunk. Unlocking factions’ special units first is an almost guaranteed win.